As I have already told you all I'm about to set off on what I hope will be a wonderful and rewarding journey with lots of other peeps and Shimelle, journaling our Christmas. As I have said before I have never attempted anything like this and I'm not a confident writer, but after seeing the wonderful Journals that people have done over the past years I feel just so inspired and can't wait to start. I have decided to do a mix of hand and computer journaling...So watch this space from the 1st Dec and I will post the pages as I do them. 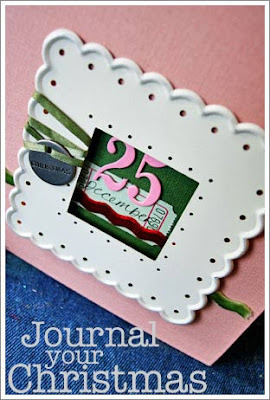 If you fancy joining us then please come on over to Shimelle's "Journal your Christmas" and join the fun. Thanks for leaving my first ever comment! Manchester too eh? I love the advent box for your mum. SO pretty.